Often when writing a lit review, APA (American Psychological Association) is the format that is requested. APA format is essentially a set of rules that must be followed when structuring and formatting the literature review. You can check out our APA format literature review example above. Short APA literature review example can be helful when you are starting to write your lit review. Page layout and formatting – standard 1-inch margin on all four sides of the page. Page number on the top right of each page. A header of abbreviated title on each page. Running head on the first page. Citations – all reference materials used must be properly documented using the APA rules for citation. For those not familiar with the writing a literature review APA style, it is a good idea to keep an APA format reference guide handy. Opening In the opening, you will have to describe your scope and what you are trying to explain with your paper. Finish your introduction with a brief conclusion where you state your thesis statement. Main body The next section, the main body, is where you critically analyze the references you have to discuss. Use subheading to organize the information. Conclusion And in the conclusion section, you will have to summarize your paper. Here you will have to tell if there are any gaps in the investigation and what things can be improved. Would you be able to provide new insight with your paper? Is the topic interesting for you? Do you think other people would find it interesting? Do thorough research: Read several times the literature you have to review, and critically analyze it. Provide references that support contrary arguments so you can have a balanced paper. Can the argument be improved? Does the author present the data in a readable way? Is there a gap in the investigation? Write your main argument: Once you have read the references, and think of the scope of your paper, you will have to write your main argument. This will be your thesis and your paper should be written around it. Write your paper: Draw an outline where you use subheadings to explain each one of your points. Once you have them, start writing your paper. For each point, you will have to cite at least one reference. Revise what you wrote: After you have finished writing your paper, revise it carefully. Proofread your text and correct any typos you may have made. You will also need to edit your text. Read it critically and see if there are any changes you would have to make. There are a large number of rules to follow when writing a literature review APA style. Some of those come up more frequently than others. Numbers less than 10 should be written out in word form. Numbers 10 or larger use the numeral form. Always use the word form if the number comes at the beginning of a sentence. 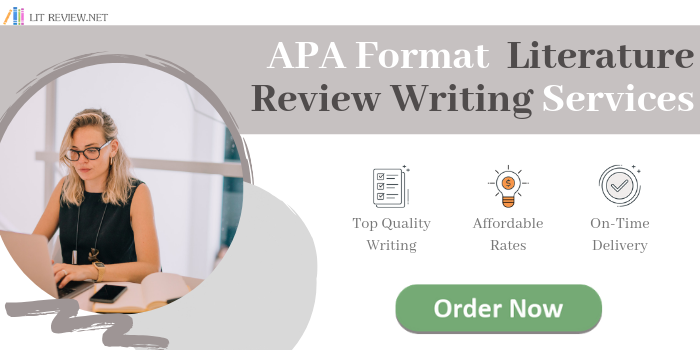 Unless you have quite a bit of experience writing APA papers, writing your APA style literature review is going to take quite a bit of time, even with APA references to verify you are getting everything done as it should be. If you encounter difficulty using the APA format, the literature review service we provide can help. We provide literature review services on any subject, at any academic level in any format requested including APA style literature review. Our writers and researchers are all college graduates with many holding masters and PhD degrees in their field of study. They also all have extensive experience working on literature reviews and APA paper writing. Because they come from a wide variety of backgrounds, those assigned to work on your particular project will have a degree in the subject field at the appropriate academic level. They will be familiar with subject terminology and jargon as well as the subject itself, ensuring a superior literature review for thesis. When you need an APA format literature review, contact us for superior literature review services at affordable rates!